Critical Path Method (CPM) and Performance Evaluation and ReviewTechnique (PERT) are widely recognized as the most effectivemethods of keeping large, complex construction projects onschedule, under budget, and up to professional standards. But thesemethods remain underused because they are poorly understood and,due to a host of unfamiliar terms and applications, may seem morecomplicated than they really are. This encyclopedia brings together, in one comprehensive volume, allterms, definitions, and applications related to the time and costmanagement of construction projects. While many of these termsrefer to ancient and venerable building practices, others haveevolved quite recently and refer specifically to modernconstruction and management techniques. Sources include hundreds ofprofessional books, trade journals, and research publications, aswell as planning and scheduling software vendor literature. The detailed glossary of all applicable terms includes across-referenced listing of examples that describe real-worldapplications for each term supplied. An extensive bibliographycovers all applicable books, articles, and periodicals available onproject planning, scheduling, and control using CPM and relatedsubjects. 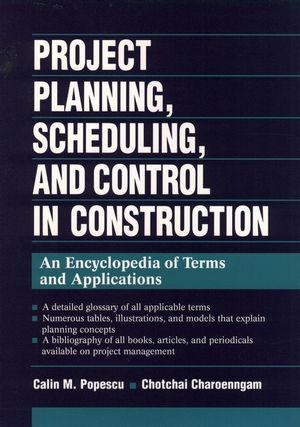 This book is an important quick reference and desktop informationresource for construction planners, schedulers, and controllers, aswell as civil engineers and project managers. It is also theultimate research tool for educators, students, or anyone who seeksto improve their understanding of the management of modernconstruction projects. CALIN M. POPESCU, PhD, holds the J. Neils Thompson CentennialTeaching Fellowship in Civil Engineering at the University of Texasat Austin. He is also a veteran of nearly twenty years in theconstruction industry, including seven years as a director ofplanning, scheduling, and design. Professor Popescu is the authorof seven previous books and nearly seventy journal publications. Heis also a frequent speaker at national and internationalconferences. Since 1982 he has served as President of C&CConsultants, Inc., in Austin, Texas. CHOTCHAI CHAROENNGAM, PhD, is a planning and scheduling consultantwith C&C Consultants, Inc. and a delay claim consultant withthe Texas Attorney General's Office. He received his PhD inconstruction engineering and project management from the Universityof Texas at Austin in 1993. Dr. Charoenngam is the author ofseveral peer-reviewed articles and is a frequent speaker atseminars and symposia.